A chemistry student has been spotted in a lecture, writing about how bored he is during that same lecture, despite having an imminent test. The student sat behind the bored man noticed that what he was writing and took a photograph for evidence. "God I am so bored. This is terrible." 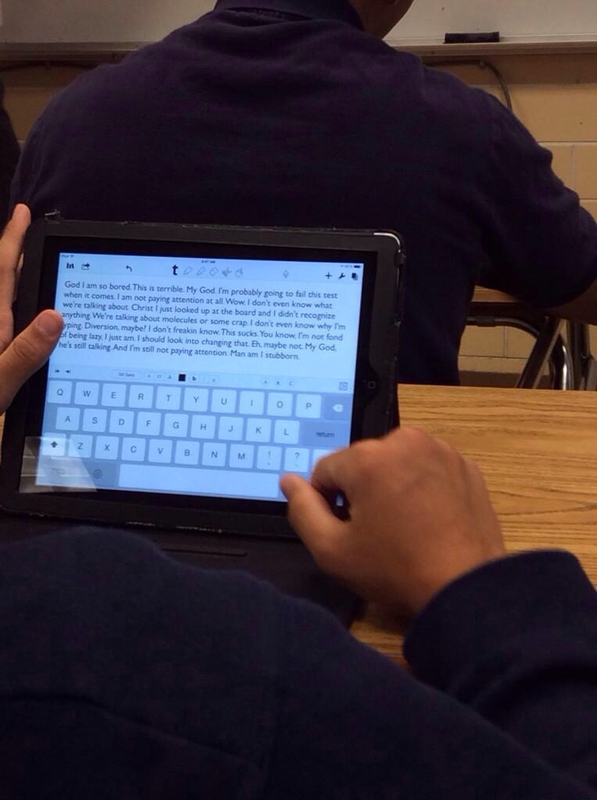 The student wrote on his tablet computer. "My God. I'm probably going to fail this test when it comes. I am not paying attention at all." The student appeared to not have been studying for quite some time, despite the upcoming test (which he was clearly about to fail). At some point he must have glanced at the board, and not liked what he saw there. "Wow I don't even know what we're talking about. Christ I just looked up at the board and didn't recognise anything. We're talking about molecules or some crap." "God, am I bored." Image via Imgur. "My God, he's still talking"
"I don't even know why I'm typing. Diversion maybe? I don't freakin know." "You know, I'm not fond of being lazy, I just am. I should look into changing that." But that moment of clarity only lasted a sentence. "Eh, maybe not," He wrote "My God, he's still talking. And I'm still not paying attention. Man am I stubborn." The student is believed to be saving up for a doodle app, or some paper to draw on in crayon whilst the lecturer tries to guide the class through the exams. Like this? Check out the 102 yr old who finally got her degree (just 60 years after she started it) or the student who dislocated her jaw singing along to Taylor Swift's "shake it off"